Very Inspiring Blogger – Who Me?! Look at me, sneakily sliding in a blog post on a Thursday afternoon! Probably no one will see it, but I really had to post this. I’ve let too much time go by already! Anyone who has spent much time around my blog knows that I am full of ideas and hare-brained schemes and always busy with about 47 more things than I actually have time for because there are just always so many interesting things to do! This would work out fine if I was one of those hyper-organized types, but alas, I am not. And although I can generally pretty much manage the chaos, occasionally things (and when I say things I mean my horrifying email inbox) get the better of me, and something slips through the cracks. I was going through said horrifying inbox and discovered these lovely gems in the cracks! 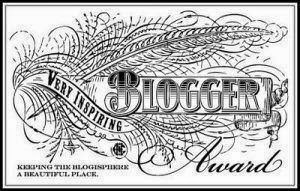 In the past month or so, I was very kindly nominated for the Very Inspiring Blogger Award by Rachel Tey over at Reading Rachel, Dayne Sislen at Dayne Sislen Designs, and Linda Eve Diamond at The Beauty Of The Picture Book! Imagine that! ME! A Very Inspiring Blogger! I am so touched! And I thank you all so much! It means a great deal to me that you would bestow such an award on me. Of course as always with these awards there are all kinds of rules. I’m supposed to tell 7 facts, and nominate 15 more bloggers, and you all know how I feel about that: I can never think of 7 interesting things to say, and I never like to single out just 15 of the many, many bloggers I know and love because I feel like everyone deserves the award. So if you want it, please help yourself and know that I find you all Very Inspiring! As for the 7 facts, hmmm…. 1. I am currently reading Just One Evil Act by Elizabeth George. It is good, but very long, and I never have enough time to read, so it’s taking me a while to get through. Next on my list is First Frost by Sarah Addison Allen. 3. I recently discovered that I like avocados – not necessarily plain, but in stuff. Who knew? 5. The most recent movie I watched was Non-Stop starring Liam Neeson. On DVD of course because it’s probably ancient by now. I literally cannot remember the last time I went to a movie. It may have been July when I saw The 100 Foot Journey, which I really liked. 6. I haven’t written a new manuscript I like enough to call finished in way too long. Many, many thanks to Rachel, Dayne, and Linda for the awards, and to all of you who show up and read faithfully, whether you comment or not. Knowing you’re out there reading makes it all worth while and I appreciate each and every one of you! Would You Read It Wednesday #160 – Finley VS The Fly (PB) PLUS The December/January Pitch Pick! Congratulations!! You are very inspiring, Susanna – not to mention funny! I laugh with every post. 🙂 Thank you! Congratulations Susanna! Well deserved…you can read your commitment and pleasure in every line! Congratulation, Sus. I didn't see this. Did it come into my inbox? Hmm. You are inspiring. Hug, hug, hug!! Thanks, Rob! No, you probably didn't get it – I posted it at a very weird time 🙂 You are inspiring too!!! Well deserved, Susanna! We love your humor and your love of chocolate. You are very inspiring, indeed! Yes you are very inspiring. I love all your hare-brained schemes. I hope they inspire you to write a manuscript you consider finished. We want more of your stories! I'm glad to hear you like audible… I was asking the library about a way to listen to books via the overdrive system. (I check out kindle books via the library a lot). Aw, thank you Stacy! Just knowing that you'd like to see another book I wrote makes me happy! 🙂 And yes – I love audible!